Pricing Policies, the use of markup rates or discounts on specific items and sales volume determine overall gross profit of an enterprise. With hundreds or thousands of individual items in the sales mix, it is difficult to assess the impact pricing policies have on overall profitability. The following Margin Management Analysis chart is an effective tool for visualizing the overall impact of item-specific pricing practices. Each point on the horizontal axis represents an individual item or SKU. The data has been sorted in ascending order by each item’s Unit Margin Percentage rate. 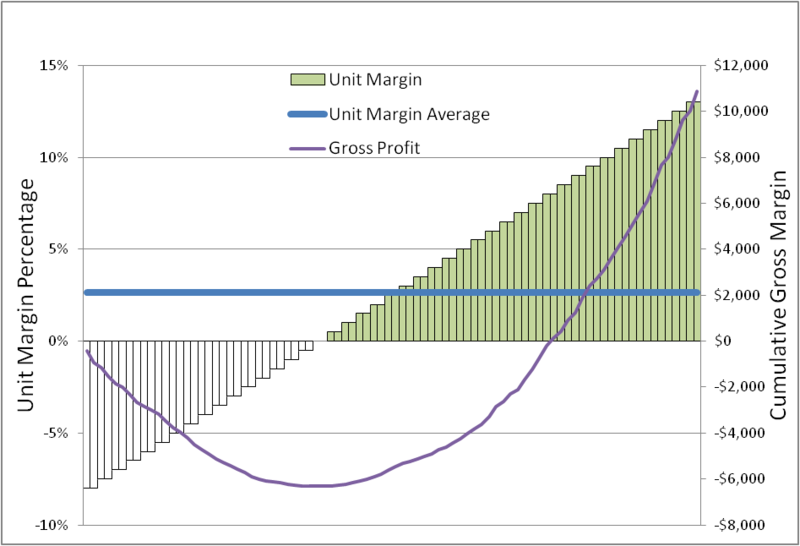 The vertical axis on the left side shows the Unit Margin Contribution and the vertical axis on the right side shows Cumulative Gross Margin Dollars. Unit Margin Contributions in this example rage from a discount of 8% to a markup of 13%. Given the relative sales volumes of each item, the weighted average Unit Margin Contribution was 2.7%. The data in this example show 37% of all products sold at a discount and 63% at a profit. It is instructive to note that 77% of all items sold are necessary overcome the 37% of items discounted and move the Cumulative Gross Profit value from negative to positive. 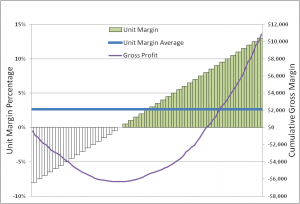 The Margin Management Analysis chart is an innovative tool for business performance evaluation and improvement.